You can never go wrong with these scones. Minimal effort with maximum yumminess. 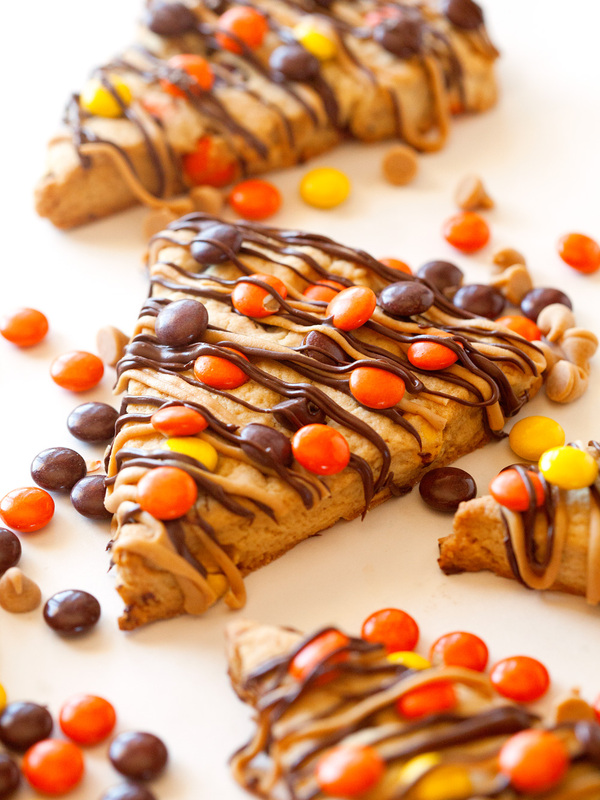 Get ready to be wowed by Reese’s Peanut Butter Scones. One of the secret ingredients to keeping these scones from being bland & dry, is adding creamy peanut butter to the dough. It adds the incredible nutty flavor to every bite while ensuring a soft and almost chewy texture. I have had a couple of scones throughout the years, and the addition of peanut butter is definitely my favorite. Let’s not even get me started on how much I am dying over Reese’s pieces and chocolate chips inside of my breakfast treat. It’s the bomb dot com! This self-proclaimed breakfast avoider is slowly being converted. I can’t even tell you how excited I am to get up in the morning just so I can enjoy my iced coffee and breakfast item of choice. I have been on a roll and loving it! Here’s the recipe to get you off to a good start, friends. Let’s make it a fabulous week :). Get the recipe for unbelievably soft and dreamy scones. As always, you just can't beat the peanut butter and chocolate combo! 1. In a medium bowl, whisk together flour, sugar, baking powder, baking soda and salt. Cut cold butter into small pieces and using your fingers, work butter into the dry ingredients until coarse crumbs form. 2. In a small bowl, combine egg and heavy cream and whisk together. Using a fork, add egg mixture to the flour mixture and keep stirring until a dough forms (some crumbs may remain). Next, add peanut butter to the dough and incorporate with a fork as well. You may use your hands to form the dough into a ball. 3. Flour your work surface and place dough ball on top. Form into a 7-8-inch circle and cut into 8 equal triangles (I use my pizza cutter for easy and more exact cutting). Place scones onto the prepared baking sheet and place in the oven. Bake for 15 minutes or until set. You don't want the scones to brown, otherwise they will be too dry. Remove from the baking sheet and transfer scones to wire racks to cool completely. 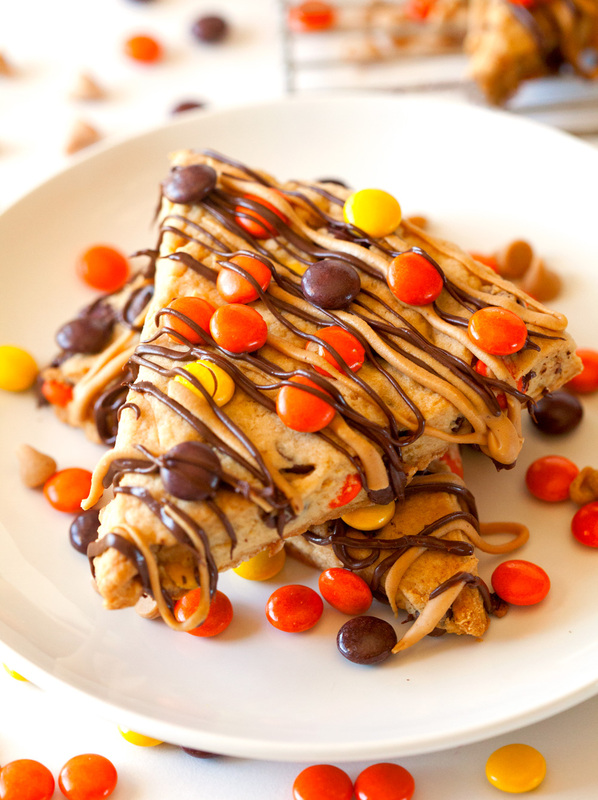 Drizzle with melted chocolate and peanut butter, if desired. Enjoy! Scones can be stored in an airtight container for up to 3 days. YUM! I love scones as well. I find it hard to believe that there is minimal effort required for these- they look so divine. Might just have to try this! Pinned. You have outdone yourself! I am absolutely drooling over these. I’m such a fan of scones and peanut butter and chocolate. 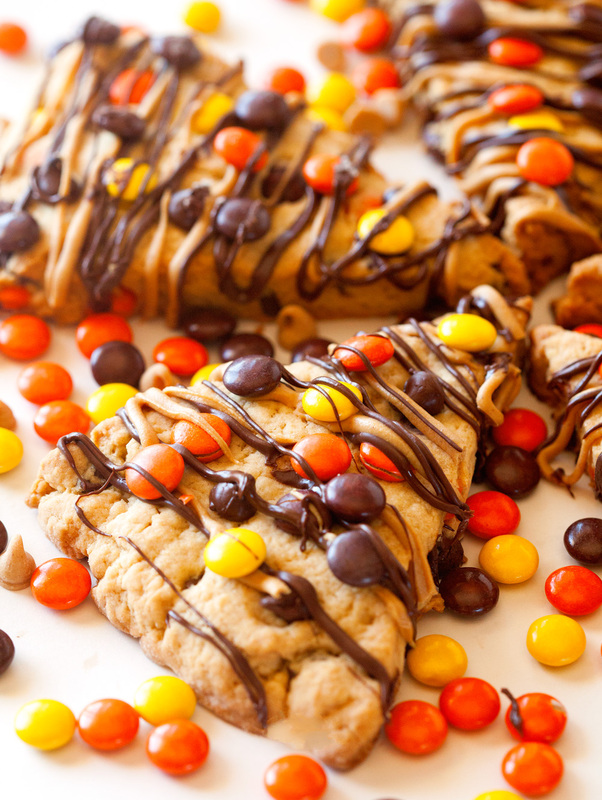 Love that you topped these with Reese’s pieces, too! Ummm yeah. Not even sure what to say about these, because my jaw is on the ground! YUM. Anytime a dessert looking treat is OK for breakfast is a good recipe! Love all the Reese’s Pieces in these. Those were my favorite candy when I was little. These pictures are beautiful! This might just be my favorite scone recipe of all time! 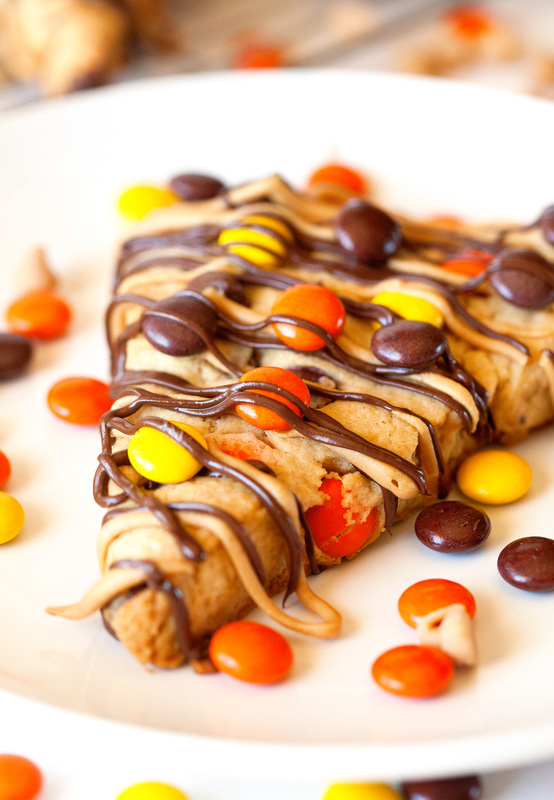 Such a great idea to create a Reese’s recipe! 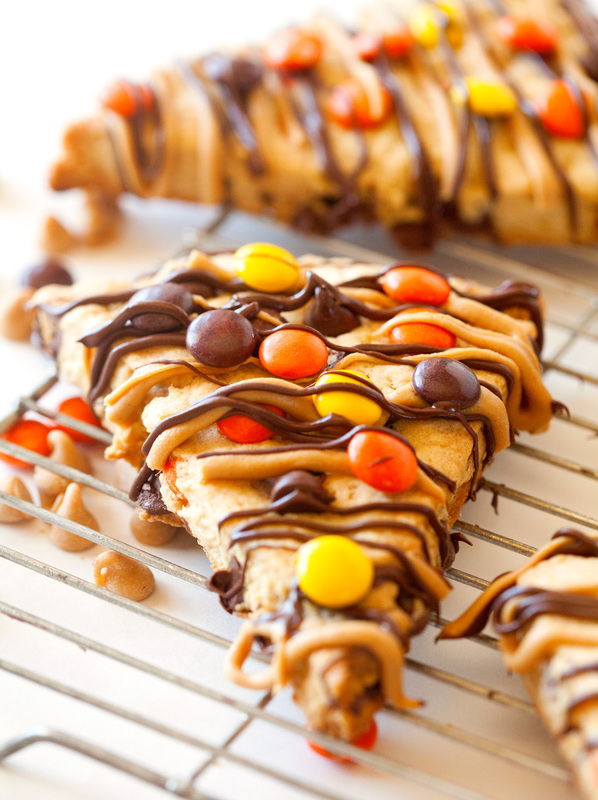 Love the addition of peanut butter in the dough. Pinned! I am crazy for peanut butter everything. I never thought to add it to scone dough. What a great idea!! Love those reese pieces 😀 Pinning! these look crazy decadent!! this is such a creative spin on scones, I’d never think to do a candy-style twist like this but it looks all sorts of delish – pinned! Oh my goodness! My husband would have a fit for these. I have to try them soon! Kathi these scones are so cute. My daughter would go bonkers for them. Pinned! These look absolutely amazing! I’m a total breakfast-lover, but there’s no better breakfast combo than peanut butter and chocolate! OMG these scones are super brilliant!! love chocolate and pb. sounds yummy! These scones are so pretty! And I bet they taste EVEN better! The more peanut butter, the better (in my opinion). YUM! 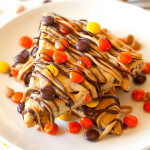 Peanut butter scones! Now that’s my kind of scone! Any excuse to have candy at breakfast, I’ll take it. 🙂 I bet these scones taste incredible, especially if paired with a dark roast coffee!